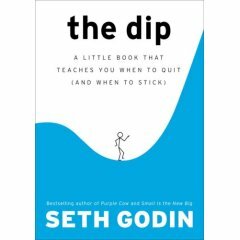 I enjoy Seth Godin's blog, so when I saw his latest book, The Dip, for $13 at a local store I couldn't resist. Actually, to call it a "book" is a bit of a stretch. We're talking well under a hundred pages with a small trim size and a very open design. It's really a long magazine article. I guess this is my week for disappointing books... Fortunately, it didn't take too long to get through The Dip, but I can't say I got much out of it. If you're familiar with the phrase, "when the going gets tough, the tough get going", and who isn't familiar with it(?! ), you're already through most of the book; if you add in the idea that it's OK to quit every now and then, well, you've pretty much mastered the whole book. The seduction of not quitting--and the source of all those stories about sticking it out--almost always comes from people moving through a market. When you hear about an author who got turned down thirty times before signing with a publisher or of an overnight sensation who paid her dues for a decade in coffee shops, you're seeing how persistence pays off across a market. On the other hand, when was the last time you heard about someone who stuck with a dead-end job or a dead-end relationship or a dead-end sales prospect until suddenly, one day a person at the other end said, "Wow, I really admire your persistence." Stop and think about that for a moment. How about that author who got turned down 30 times? They're cited as someone who got through "the dip" and succeeded. But up to and including the 29th rejection, wouldn't it appear that this author was living in "the cul-de-sac", or the non-dip model where Godin says "work doesn't get a lot better...doesn't get a lot worse...it just is"? In fact, what if that 30th submission didn't result in a deal for this author? What if they wound up getting rejected a hundred times?! Are they still working through "the dip" or stuck in "the cul-de-sac"? I couldn't help thinking of the lessons learned from The Black Swan while reading this book. In short, the concepts in The Dip may be useful in describing results from the past, but I'm not so sure they're all that valuable when trying to assess the future; the "dip" you're working diligently through right now may wind up being nothing more than a "cul-de-sac". I feel the same way about this book. To me, it was disappointing. Any attempt to devise a formula for sticking it out vs quitting is doomed to fail because the reality is too complex.